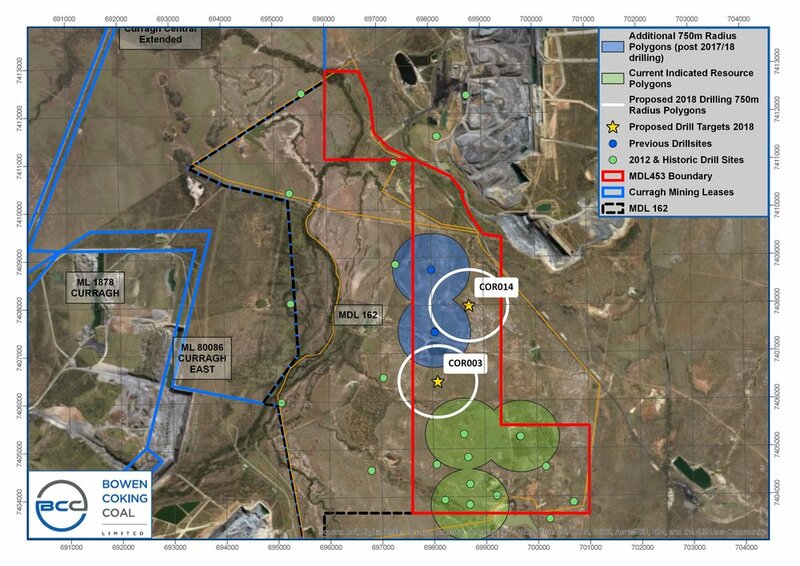 Cooroorah is located 17 kilometres north of Blackwater, between Westfarmers’ Curragh mine (and MDL 162) in the West and Jellinbah Mine in the East. The Project targets the well-known Rangal measures and hosts the Aries, Castor, Pollux and Pisces seams. In July 2013, the Company announced a JORC 2012 compliant resource estimate for the project of 125Mt, comprising 70Mt indicated and 55Mt Inferred resource. In November 2017, the Company commenced its maiden drilling program comprising two HQ drill holes to target all four coal seams for resource delineation and to test the washability and coking coal quality. A secondary shallow target in the lower-yielding Burngrove Measures exists towards the Eastern side of the tenement which will be investigated further in the light of recent beneficiation developments in the industry. Cooroorah is well located for services and infrastructure, and is proximate to haulroads, rail lines and wash plants with spare capacity.